Customizable Moto Maker options for Moto X have ended as of 9/23/14. 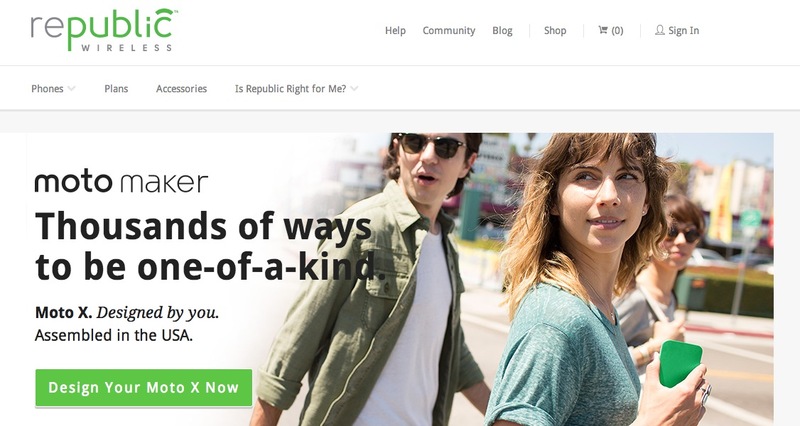 Normally this page would tell you you’re leaving Republic Wireless to go build your very own Moto X on Moto Maker. But! All the Moto X Moto Maker phones are sold out. No more. Done-zo. All gone. Finito. This statement would lead people to believe that the customizable Moto X design is no longer available. That’s just not true, as can be seen on the Motorola Moto Maker web page. If you try to engage in a chat session with customer service at Republic Wireless, you’ll likely be mistreated. At least that was my experience (see transcript below). In fact, had the customer service person been a little less defensive, this article might not even have been written. … but Moto Maker wasn’t an option on your site, it was and still is an option on the Motorola site. The statement is a bit misleading. For those really wanting a customized Motorola phone, it is actually still available. Telling the truth may result in your losing customers, but it’s the right thing to do. What I’m saying is that the statement on your site is a bit misleading, that’s all. Some people really like the idea of making a custom phone. They will be lead to believe that option isn’t available any more. So, they will just go ahead and get a non-customized phone through Republic Wireless. Then later, they will find out that they could have had that amazing customized phone they really wanted, but they would have had to go with another carrier. This is the point left our on your website. All I’m saying is that for those customers who forgo the customized phone, believing (from reading on your site that it’s no longer available), those people will feel mislead. Your statement should read, “You can still customize your own Moto X phone, but if you do, you’ll need to find another carrier. Republic Wireless only offers two designs (black and white) of the Moto X.” It’s really just that simple. Just let people know that there’s another option. Thanks for insight. However, if you click on the link, we are not misleading. We are making it clear that Moto Maker option is not available through Republic as well as giving you the date. Also, we are allowing you to sign up for updates in case the option becomes available with future devices. Brandon has closed the chat. While I was typing a reply, the chat was abruptly ended by the customer service representative (Brandon). This is the equivalent of hanging up the phone on someone. The image below is a snapshot from the Moto Maker page on the Republic Wireless website from 30 September 2014 at 2:00 PM CT. They are leaving their Moto Maker landing page live, presumably to bring in search traffic, then misleading people into believing the Moto Maker is discontinued. Click the image for a larger view. That said, apologies you were left unsatisfied with you chat session. Brandon is one of our favs and we’re glad to talk.